On one of the steepest mountain finishes in Grand Tour history, Vuelta leader Joaquim Rodriguez (Katusha) held firm against a barrage of attacks from rival Alberto Contador to take another step towards Vuelta glory. A few minutes in front, all-day breakaway Dario Cataldo (Omega Pharma-Quick Step) battled to stage 16 victory on the precipitous finish at the Asturian ski station Cuitu Negru. The last climb’s opening 21 kilometres up the existing Pajares climb made it tough enough, but the man-made final three, on recently tarmacked road which often touched in excess of twenty-per cent, made it downright cruel, albeit a spectacle. After a fast, frenetic start, Cataldo and Giro third place-finisher Thomas De Gendt (Vacansoleil-DCM) stole away 50 kilometres into the race. They gained a maximum of thirteen minutes as the bunch tapped up the Puerto de San Lorenzo and Alto de la Cobertoria waited for the fierce final haul. The race leaders appeared to be more interested in shadowboxing. Race leader Rodriguez fell to the back of the pack on the Cobertoria, and Valverde and Contador joined him, taking a gander at whether their rival was bluffing. Saxo Bank-Tinkoff Bank hit the front for Contador on the lower slopes of the final ascent, setting a rapid pace which left Sky leader Chris Froome hanging on at the back. Contador’s first significant acceleration came with six kilometres to go, taking Rodriguez, fourth-placed overall Alejandro Valverde (Movistar) and the latter’s teammate Nairo Quintana away from the rest. Again and again the Spaniard surged. Onto the freshly-laid tarmac and the final three-kilometre haul up to Cuitu Negru, another bid from Contador on 23% gradient dropped Valverde, but he could not get rid of Rodriguez. In front, it was cycling in slow motion as Cataldo painstakingly crawled to the finish line on the 22% gradient to edge out De Gendt. Having kept Contador at bay, Rodriguez surged two hundred metres out and added a few more precious seconds to his slender lead. Valverde couldn’t match the pair’s constant accelerations, but his well-judged pace ensured he finished within twenty seconds to extend his lead over Chris Froome in fourth place overall. 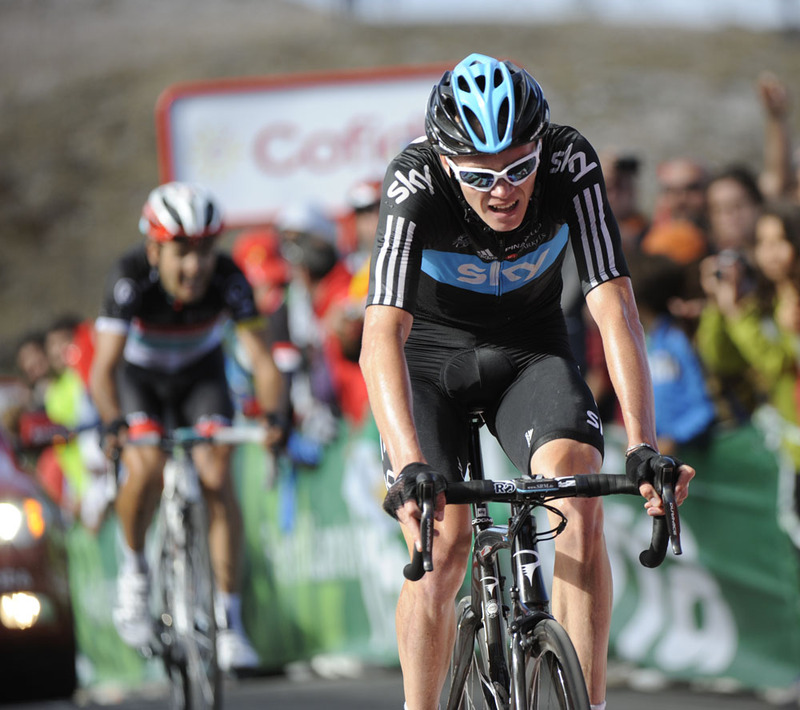 The Team Sky leader finished two and a quarter minutes later in fourteenth, grinding and grimacing up the punishing final pitches of the climb. In taking on two Grand Tours at full bore, he may have bitten off more than he could chew. The Vuelta has its second rest day in Santander tomorrow. 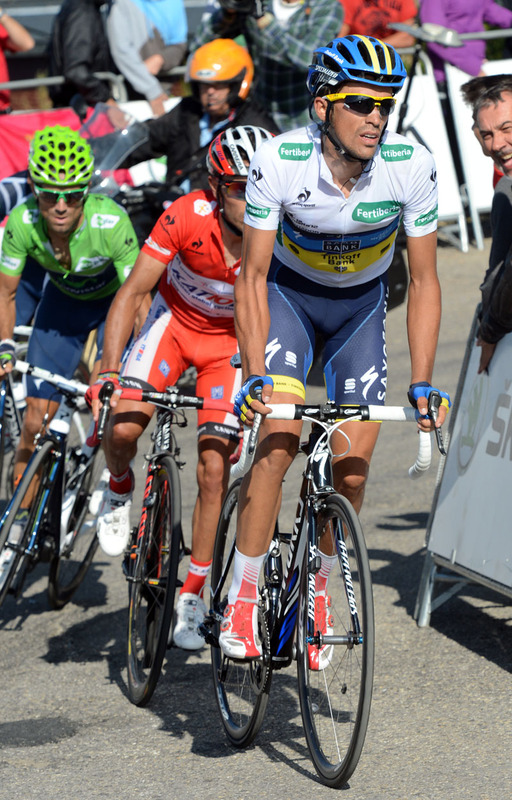 Rodriguez only leads Contador by twenty-eight seconds. 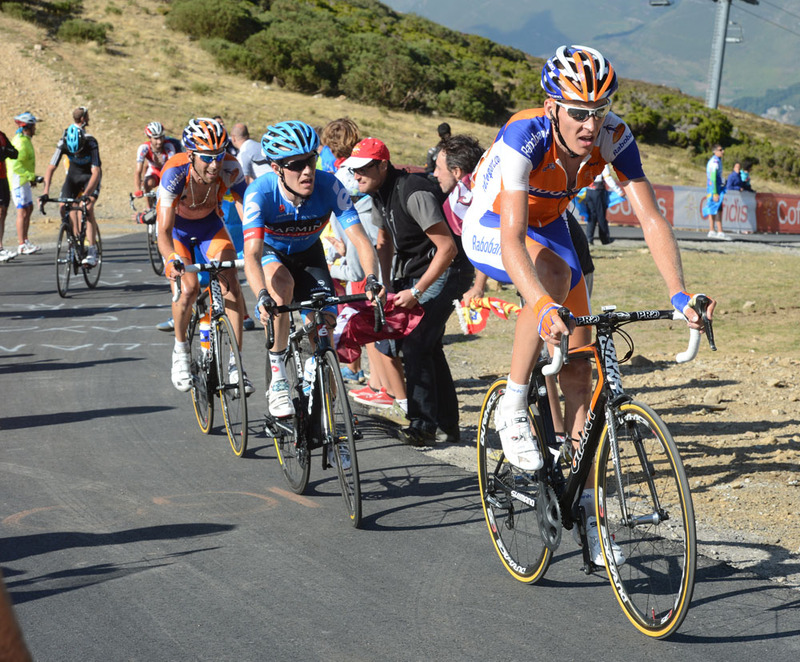 With three predominantly flat stages to come, the 2012 Vuelta will surely be decided on Saturday’s twentieth and penultimate stage, with its finish on the mountain of Bola del Mundo.